Growing up in Memphis, Tennessee, Elizabeth Davis, BSN, RN, CPN, always knew that nurses and doctors at St. Jude Children’s Research Hospital cared for critically ill youngsters. Today, the hospital is the only workplace she has ever known. 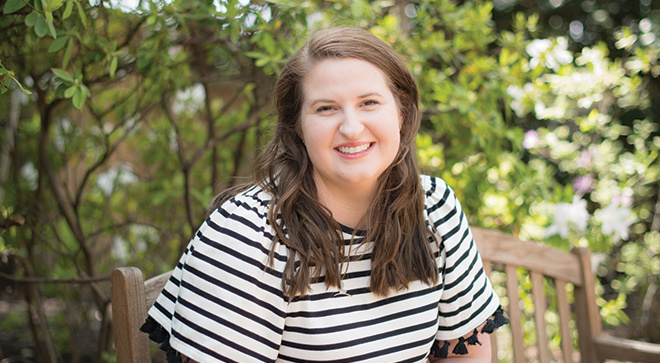 With 5 years’ experience, Davis is a relatively new nurse, but her colleagues recognize her dogged determination to work for her patients and their families through a variety of councils, committees, and projects. During a fellowship at St. Jude, for example, Davis explored better ways for children to communicate their nausea levels by using the Baxter Animated Retching Faces (BARF) scale, an undertaking that reflects the values of a hospital committed to shared decision making. Davis explored better ways for children to communicate their nausea levels by using the Baxter Animated Retching Faces (BARF) scale. After her project was finished and presented, it was implemented throughout the hospital, and Davis decided to stay in the fellowship role to mentor the nurses coming after her. “I helped the nurse who nominated me with her project, which looked at how nurses deal with fatigue while working,” she says. Davis recognizes that many outside the hospital setting who hear about her job conclude that they could not deal with the pain of children and their families. But she handles this tough situation by giving her patients the best days she can, no matter what those days are like. “I try to understand this through the prism of childhood,” Davis says. Due to her work, Davis understands what children are capable of, and in her estimation, they do not get enough credit. For example, some parents hold back health information from their children, particularly when the news is bad. The field of oncology seemed a natural fit for Davis from the first time she treated a patient. Since then, she has worked with patients from all over the world and looks forward to helping many more. This year, Davis was honored as a finalist for the Extraordinary Healer® award for Oncology Nursing program conducted by CURE®, a sister publication to Oncology Nursing News®.